Localrootz Project: Autumn changes, leaves and falls. Autumn changes, leaves and falls. Autumn is closing in on the homestead and leaves are being kissed by frost as heavy clouds of warm breath flow from my mouth. I find myself spending more time rubbing my hands together than actually getting work done. My wife doesn't find my morning fires quite so strange now that the chill has creeped into the mornings and the stacked wood is alread starting to be brought in to take the edge off from time to time. We still have been putting as much jars and bags of greens away in preparation for the upcoming winter where the tasty summer treats and sun ripened fruits will be a distant memory. Our adorable kitty Merrimac is awaiting the snow when yard work will dwindle and lap time by the fire will be more abundant. Our most recent canning project included a gift of over ripe peaches from a secret source that I will never divulge the location of. Step one was to blanch the ripe peaches in boiling water to remove the skins. We then proceeded to boil them down in a solution of local Frith Farm honey and our own maple syrup. After the mixture became thickened and the peaches started breaking up we added heaps of our homegrown hot peppers as well as a touch of apple cider vinegar and a little adult libations. By a touch I mean about a bottle minus a small glass for the chefs. Pureed and canned into a big batch of our secret spicy peach whiskey sauce ! So far we have used it to marinate chicken, pork and salmon as well as just using it as a salsa. Few more batches of Tomato Sauce to make sure the cellar is thoroughly stocked. We ended up with 5 slightly different batches making just under 48 jars of tomato sauce ! Besides cooking pot after pot of tomato sauce and boiling and canning to help take off the early morning chill, we also spent lots of time splitting and stacking wood for the winter. I always remember reading the Good Life by Helen and Scott Nearing as they talk the truth about how wood provides heat twice. Once when you have to split and stack it and again when you burn it. No truer words have been spoken ! We got about four rows filled with easy access to the basement for hauling in throughout the winter. I used old pallets from work that will keep the wood off the ground and left about a foot in between each stack to allow it to further season for optimal heating. To keep the stacks tidy I side stacked a few pallets and devised a pretty clever way of using a few pieces of rebar I had laying around and wedging them between some long branches to keep the pallets lined up and supported so they would not just fall over and ruin the stack. Ill let you know how well it holds up through the season. We decided to stack a small amount right on our back deck for super easy access. Will keep this pile stocked until the snow pack makes it to difficult to wheelbarrow it up the hill and around the house. Wild Turkeys heard they were welcome here... they were safe I couldn't get them into a peach sauce this time ! The cold weather has been spotty but the colors are amazing and the garden is finishing up nicely too. Too much to handle... chop it up seal it in some plastic freezer bags for a winters day. Late season kale crop from early mid-October. Final harvest and slowly putting the beds to rest. Fill a pan with as much hot peppers, rainbow chard and of course eggplant. Roast it till your house smells amazing and everything starts to meld together... add a bunch of fresh herbs and cover in some mozzarella. Do not forget to go down to the cellar and pull out a great wine to accompany your dish ! Wait I forgot something... Dessert ! Stack up all your leftover apples from your wifes day of picking apples with her Dad, sister and niece and start peeling. Add a stick of butter some local oats and a generous gulp of honey and cinnamon. Bake it to perfection and whip up some bourbon whip cream using some deliciously farmy local raw cream from Misty Brook Farm and a touch of homestead maple syrup and presto ! I was so anxious to get it in my bowl I didn't take an artsy food shot of the final crisp ! As the heavier frosts have pushed on I have been slowly drying out the herbs we have left in the herb gardens. This guy appeared at the end of October and was shockingly large... we have plenty of Downy and Hairy Woodpeckers around but this was our first Pileated Woodpecker. He must have been close to 20" long and when he flew off into the deep woods as I tried to get a better picture his wingspan was astounding ! The raking process unearthed many interesting varieties of fungus. Ok enough mushroom hunting back to the leaves. The good thing about living in the woods is your really just moving leaves... most of our 5 acres are woods so we decided it would be nice to clear them from our small lawn in front and pull the layers away from the house to keep the moisture away from our foundation but really we just filled the tarp and dragged it out into the woods and spread em out. We also are utilizing as much as we need for our compost pile and to cover our raised beds to protect them from the harsh winter weather and add some additional nutrients to the soil. Round One of raking is complete but there are still plenty of leaves on the oak trees for a round two. Now to put some of these leaves to good use. Our garlic bed full of compost. Organic Garlic Seed from a local farm. Poke some holes about finger deep, 3 or so inches. Fill each hole with a garlic bulb with the pointy side up. Spaced them about 6 inches apart knowing the soil is very fertile and the bed is a few feet deep. All in all about 100 planted so far. Hoping to build one more similar sized bed in the first week or so of November. Dirty hands are busy hands, spread a layer of soil over the planted garlic. Emptied my last lawnmower bag of grass clipping and mulched leaves on top of the cover garlic. Top off with some dried piles of oak leaves and watered liberally. I think planting garlic on the first day that you see geese starting their winter migration is a good rule of thumb. Speaking of birds we stocked up on winter feed for our little feathered friends ! Time to relax with a little fire and a morning camp coffee... "camp" is code for spiked, a little bourbon for breakfast on my day off is usually well deserved ! After some campfire time we covered the rest of our beds with leaves for the winter but the chard is still holding on for dear life. Another batch for the freezer. Sealed and waiting for a winter stir fry. I like the self vacuum seal method using some old fashion lung power. Also excited that the Katahdin Mint I bought a bunch of from Crown of Maine rooted... I've always secretly wished I had this variety which is a mint that was foraged from the shadows of Mt. Katahdin. I decided to try to root a cutting and it worked. Now to keep it happy till the Spring so I can plant it in our herb garden. The other winter addition to the homestead, not pictured here but the old goat shed was prepared for its arrival was an old Ariens Snowblower my father salvaged from a barn in MA and restored to working order. I do enjoy shoveling but with plans to expand the homestead to include livestock in the coming years I foresee us having many more important projects than shoveling and the usefulness of a snowblower will be much appreciated. That being said, after we drove the behemoth snowblower into the shed we both agreed a door would be a good idea to shelter the toolshed from the elements. A week later and a few trips to the lumber store and the goat shelter is now a secured shed ! As I finish typing this recent post it is now November 8th. Autumn had came in with some fierce frost in late September but from mid October till present, things have gotten strangely mild and the outdoor projects are continuing to get accomplished. Next on the list are chopping down a few trees in order to open up some daylight for a small greenhouse as well as open up a place to plant some fruit trees come spring. We also hope to finish building another raised bed or two, one to get some more garlic planted and another to visualize what we will have for growing space come Spring. We are anxiously awaiting this years seed catalogs and plan on planting some much more obscure heirloom varieties of vegetables this upcoming season. 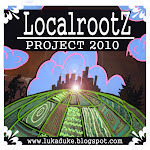 Stay tuned for more notes from the localrootz project. As you can see this has almost just become a homestead journal for ourselves to look back on the things we have learned, the things we have accomplished and the things we dream about. I hope some information is interesting to the friends and followers that pass through to find out whats new with the localrootz project. Feel free to leave comments, questions or ideas if you have them. Lookin good! Fun to see all your progress. I haven't planted my garlic yet...hope it's not too late! Thanks Kate ! I think you will be just fine planting in the next week or so especially with these moderate temps we have been experiencing. Keep up the great work over at The Blueberry Files, you've been much more consistent than me :) Congrats on the books too !